Concerns about American power and influence have risen in countries around the world amid steep drops in U.S. favorability and confidence in the U.S. president. It’s worth noting that worries about all three countries trail concerns about other tested threats. People are much more likely to feel threatened by ISIS and climate change, in particular, but also by the condition of the global economy, cyberattacks, and refugees from countries like Iraq and Syria. Nevertheless, the proportion of the public that views American power as a major threat to their country grew in 21 of the 30 nations between 2013 and 2017. The largest increases occurred in Spain (42 percentage points), Chile (34 points), and Turkey and Ghana (28 points each). Just in the past year, perceptions of the U.S. as a major threat have increased by at least 8 percentage points among several long-standing American allies, including Australia (13 points) and the UK (11 points). Concern about U.S. power is up 10 points in Canada, Germany and Sweden, and 8 points in France and the Netherlands. In other countries, however, fewer people see the U.S. as a major threat compared with four years ago. In Poland and India, for example, the share of people who believe U.S. power is a large concern for their country decreased by 8 percentage points. 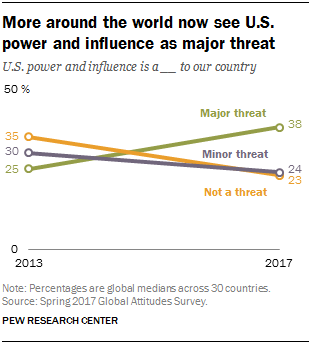 And in Russia, the Philippines and Jordan, perceptions of American power as a major threat did not change between 2013 and 2017. In Japan, people see China and the U.S. as almost equally threatening: 62% of Japanese respondents see the U.S. as a major threat while 64% say the same for China. On the other hand, fewer than one-in-five in Israel (17%) and Poland (15%) say American power is a major threat. America’s neighbors, Mexico and Canada, both see the U.S. as more threatening than either China or Russia. In Mexico, a 61% majority perceives U.S. power as a major threat. And in Canada, 38% feel threatened by the U.S. This figure exceeds Canadians’ threat ratings of Russian and Chinese power (30% and 25%, respectively). Concerns about U.S. power and influence differ by demographic groups across a number of key U.S. allies. In Australia, for example, women are 20 percentage points more likely than men to feel American power is a major threat. Women are also considerably more likely to view the U.S. as a major concern in Canada (16 points), Japan (11 points), the UK (11 points) and France (10 points). Those on the ideological left are also more likely than those on the right to see U.S. power and influence as a large concern. In the UK, for example, 52% of those on the left see American power as a major threat to their country. Just 29% of Brits on the right agree. The left-right gap is 22 percentage points in South Korea, 20 points in Canada, 18 points in Australia, 13 points in Greece, 11 points in Sweden and 8 points in the Netherlands.